The Stadium Theatre will host a production of the smash rock musical American Idiot from August 11 through the 13th. 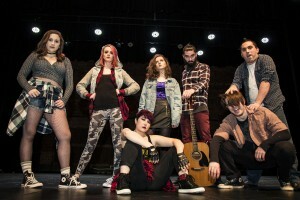 Featuring songs from Green Day’s Grammy Award-winning album, the show follows the journey of a new generation of young Americans as they struggle to find meaning in a post-9/11 world. Daniels, who lives in Lincoln, recently appeared in Goodbye and Hurry Back at Arctic Playhouse. Daniels credits his fellow performers and the production staff of American Idiot for making his experience so enjoyable. Green Day’s American Idiot album had a profound impact on Daniels, who was deeply affected by the September 11, 2001, terrorist attacks. Jade April is playing Whatshername, a young writer who gets involved with Johnny. April, from Mansfield, Massachusetts, is performing at the Stadium for the first time. She has performed in several community theater productions including Les Miserables and School of Rock. “This is probably the best show I have worked on, period,” April said of American Idiot.